Last year there was a pretty large buzz around the launch of the La Roche Posay 3-step Anti-Blemish System and I was lucky enough to be sent one for review. The kit is designed for people who have oily and blemish prone skin which I don't really have but I do love the Effaclar Duo[+] and was interested to see how the 3-step system would work for me. 3-step systems are nothing new in terms of the cleanse, tone moisturise and we've seen them from the likes of Clinque and Liz Earle but dare I say they can be pretty basic in their method and with La Roche Posay promising to help reduce sebum levels, remove bacteria, reduce pore size, matte skin and improve the appearance of skin by reducing marks from old blemishes it was certainly more targeted. The system is priced around £32.50 (I say around as you will always find offers in Boots etc) and contains Effaclar Purifying Gel Cleanser, the Effaclar Clarifying Toner which is new to the UK market and my favourite the Effaclar Duo. La Roche Posay say that you will only need these three quick and easy steps to 'dramatically improve your skin'. The Effaclar Cleanser is certainly not a luxurious cleanser compared to other items of my line up. Whilst I wasn't averse to using in the mornings, it wasn't enjoyable like my balm cleansers I prefer to use as part of my evening routine despite doing well against removing make up. For me my skin just isn't oily enough and I found this vile tasting (it happens!) cleanser to be too drying so if you are in any category other than oily skin I would be mindful of using this. I persevered using, moving to only morning use but after a week I was developing dry patches and decided to admit defeat. Obviously this isn't a negative towards the product because it wasn't suitable for my skin type and a cautionary tale that if you want to strip back your skincare regime ensure you are still using the right products for your skin type. As an aside I'm currently using the La Roche Posay Physiological Cleansing Gel* which I much prefer. Targeted for all skin types it's much less drying than it's Effaclar cousin despite being very similar in formula and consistency. I tend to use this as a morning cleanse although found it just as effective of an evening when needing to remove make up. 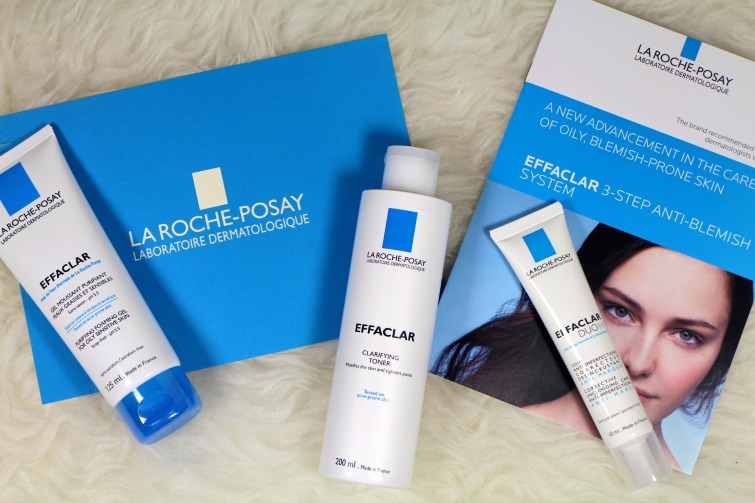 In a nice bit of marketing from La Roche Posay they have included in this kit the Effaclar Clarifying Toner which is a new to the UK market and only available in this kit. As this type of cleanser is having 'a moment' in the beauty community and of course it's suitability to be used when needed rather than regularly it is the more favoured product from the kit but many reviewers (unless of course you're blemish prone and the full kit works as instructed). Again like the cleanser this is too drying for me to use daily but is certainly a saviour during hormonal periods and when I'm having a breakout. This toner contains the 'favourite' acids Lactic and Salicylic both of which aid reducing breakouts and this toner will unclog your pores and smooth your skin. The Effaclar Duo which divides opinion as much as marmite has been mentioned on Florence and Mary numerous times. Since my initial review it has appeared in favourites and been repurchased numerous times. I love it and it has holy grail status. I use this ad hoc throughout the week during my serum step and find my outbreaks are significantly reduced. As part of the 3-step routine it is to be used to correct and hydrate so double duty if you will. The Effaclar Duo[+] will work to reduced the appearance of blemishes and unclog pores as well as reducing the appearance of any marks left from old blemishes. Of course I know this product works but as I mentioned I use it in amongst my routine and as a moisturiser it just didn't feel sufficient. Again I mentioned my skin type isn't that which this routine is marketed for and as I steadily approach the grand old age of 36 my skin concerns require a little more attention. Overall in summary whilst this routine wasn't for me and it's time to go back to my more than 3-steps routine I can see how it will benefit the oily and blemish prone amongst us. Of course with the exception of the cleanser I will still enjoy using the products in my more in depth routine but I think for teens it could be a hit. It's simple packaging makes it friendly to the males who suffer from skin concerns and again I think having only 3 steps to think about means that it would be used as directed without any tantrums. It's price point whilst on initial purchase can seem pricely for the 'only' three products you need and with an anticipated six weeks usage as well as factoring in your offers it's much more cost effective and time consuming than adding, trialling and using multiple wonder products. How does this sound to you, are you an oily skinned blemish sufferer or maybe know someone who could benefit from this range. I used this kit for a while and found it worked really well for calming down my breakouts, but it left my skin incredibly dry! This is definitely one for people with oily skin. I have combination which I think was the problem. I still use all of the products, because they are great, just not together.